In the last article we looked at Spring-boot and accessed the database using the JdbcTemplate class.Today we’ll rewrite the same application but by using JPA and Hibernate instead. The Spring Initializr web page have changed a little since the last time, so the first part will be a little different. 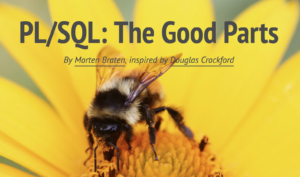 I just came over these slides and nice little overview of the PL/SQL language by Morten Braten. The slides covers many good tips to follow when coding PL/SQL. It’s not ment to be an introduction to the PL/SQL language, so many topics are just mention briefly and would need to be followed by further reading and/or investigation. But it is definitely worth a look! There is only one thing I used to miss from my Windows environment – Notepad++. After switching to Mac and OSX I have been looking for an alternative. For a while I was using Atom, but did not really find it efficient. So I often ended up using the default TextEdit utility. The other day I got a tip from a Java developer at Bouvet. 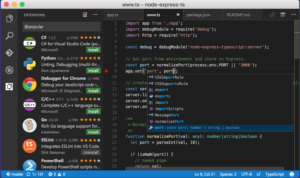 He was using Visual Studio Code 2 (https://code.visualstudio.com/) . I have used this for two weeks now, and is very very happy with it. Finally a text editor which beets Notepad++. 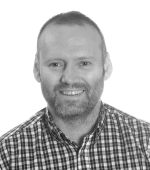 Today we’ll be looking at Spring-boot and a tools which developers use to migrate databases, FlywayDB. We’ll also look at how you can automate grants towards our two roles (which we created in part 3) whenever new tables are created. This is the fourth blog in this blog series which I have called “Java & JDBC for Oracle DBAs”. Now we are finally ready to start to develop towards the Oracle database we created in part 1, and schemas we created in part 3. Finally we have come to the point where we start to create some Java code. First we’ll install Git, the most widely used modern version control system. We’ll continue to download some code from GitHub to create our Oracle schemas, and then we’ll create a very simple – but our first – Java application. We’ll test compiling and running our code both from Eclipse and from Maven. Finally we’ll extend our application to use the JDBC driver and connect towards our database and our new database schemas. Today I’ll continue with my series on creating an Java and JDBC test application for Oracle DBAs. Working together with Java developers I sometimes have to test aspects of the JDBC programming. When cooperating with the Java developers it is also very convenient to know some Java. In this blog series I’ll describe how you can build your own Java test application, and how you can get a little more acquainted with the Java world. The blog series will not be a tutorial in Java. You can find several Java tutorials on internet (for instance – https://docs.oracle.com/javase/tutorial/). @lasjen @UKOUG Ah! So now I know who was asking all of the questions! 😃 I don't know, but as you can use DBMS_PARALLEL_EXECUTE in SE, which uses the scheduler, it would seem likely. @lasjen Not run into it before, looks like it's going to be specific to Solaris docs.oracle.com/en/database/or… Probably worth looking to see if particular p1 or p3 values are more frequent than others. Should be interesting! @lasjen @GeraldVenzl documented all latches recently so maybe he can help or direct to right person. For the avoidance of any doubt, all views expressed here are my own and not those of past or current employers, clients, friends, Oracle Corporation, EVRY, my Mum or, indeed, my mother in law. If you want to sue someone, I suggest you pick on Tigger, but I hope you have a good lawyer. Frankly, I doubt any of the former agree with my views or would want to be associated with them in any way.